Lack of sleep, your period, allergies, too much salt, crying and even leaving your contact lenses in too long are all reasons your eyes may be puffy and swollen. And that’s not a good look on anyone. But there’s good news. You can banish those unsightly bags and dark circles naturally. Here are seven essential oils to beat puffy eyes for good. Geranium oil is an astringent. It tightens facial skin and minimizes the look of wrinkles and puffiness. It’s also known to tighten facial skin and slow the signs of aging. So, it’s ideal for using around the eyes for puffiness. This powerful essential oil is moisturizing and promotes blood flow to the face, which in turn, increases the production of new skin cells. This may also help with thinning of the skin as we age. Simply mix two drops of geranium essential oil with a half teaspoon of pure aloe vera gel. Apply as needed. Lavender essential oil has a sedative and calming effect and has been used cosmetically for centuries. In fact, it contains powerful antioxidants and is known to slow aging. Lavender oil also has diuretic properties that help drain fluid stored under the eyes that cause puffiness and bags. Create a lavender eye serum by combining 20 drops of lavender oil, 1/4 cup of sweet almond oil and one tablespoon of organic beeswax in a small container. Place a small dab on your fingertip and gently rub beneath your eyes each evening before bed. Leave on overnight, and wash your face in the morning. Rosemary essential oil is known for its wide array of health benefits. Topically, it’s soothing, helps tone the skin, improves dryness and can rid you of those puffy eyes. Additionally, it gives skin a healthy, even glow. Create a calming eye oil by combining 10 drops of rosemary oil with 10 drops of vitamin E, 10 drops of jojoba oil and 1 tablespoon of sweet almond oil. Gently massage the mixture under your eyes and allow the oil to sit for fifteen to twenty minutes. Rinse with cold water, and then wash your face as usual. Bergamot essential oil is a citrus fruit with a wonderful orange scent. Its rind is used for extracting the essential oil. Bergamot oil has anti-inflammatory properties that tones and tightens the skin according to research. Use it diluted with your favorite carrier oil, under the eyes, to alleviate bags and puffiness. Chamomile is well known for its calming effect. But beyond calming, German chamomile essential oil is high in azulene. This anti-inflammatory compound can help reduce puffiness. To use the essential oil, combine a carrier oil like almond oil with two drops of chamomile essential oil in a roller bottle. Apply under the eye and blend with your fingertip. If you prefer, you can also use cooled chamomile tea bags to alleviate puffiness. When it comes to reducing puffiness under the eyes, cypress essential oil is ideal. Its astringent properties help shrink under-eye bags, making skin appear tighter. It also has anti-edema properties that help relieve fluid retention. Simply add one drop of cypress essential oil to half a teaspoon of shea butter. Mix well and apply under the eyes. Rosehip oil, also known as rosehip seed oil, is ideal for puffiness and ridding your eyes of dark circles. Rosehip used by Mayans, ancient Egyptians and Native Americans has amazing healing properties with significant anti-aging benefits. Combine the oils with the aloe vera gel in the bottle. Shake well and apply under the eyes at night before going to bed. Blend in with your finger. Although essential oils are usually safe for daily use, there are precautions you should adhere to. Test for allergies first, before using any oil. Simply dab a bit on the inside of your wrist and wait for any reaction. Additionally, avoid putting essential oils in your eyes. That means when using essential oils under your eyes, stay away from the lash area. Always use a carrier oil when applying essential oil to the skin. Never use undiluted essential oils on your skin, as they may cause irritation. And of course, if you are pregnant or nursing, avoid using essential oils. 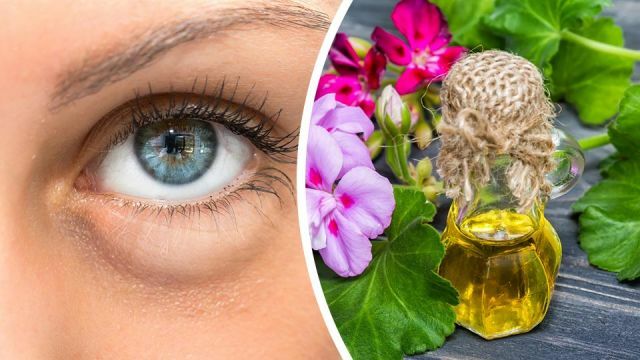 Hey Buddy!, I found this information for you: "7 Essential Oils To Beat Puffy Eyes". Here is the website link: https://www.thealternativedaily.com/7-essential-oils-beat-puffy-eyes/. Thank you.